Along with the makers of Clearasil, the makers of Noxzema (sometimes misspelled Noxema) skin care products are the dominant forces in low-cost acne skin care. The problem with Noxzema is that its acne products just don’t work for any but the oiliest allergy-free skin. Unfortunately none of Noxema’s acne products deliver what they promise. The distinctive pleasant smell of Noxzema products is from a mixture of camphor, eucalyptus oil, and menthol, antibacterial ingredients that can irritate the skin. No Noxzema product offers sun protection. Unfortunately, none of the Noxzema acne or blackhead products work as advertised. Almost all Noxzema products contain camphor, eucalyptus oil, and menthol. These ingredients are practically a trademark for the company. You open the jar or squeeze the tube and you instantly know it’s Noxzema. The problem with some of these ingredients is that they irritate the skin1. Camphor is an aromatic substance made from the bark of a tree that is closely related to cinnamon. Applied to the skin, it dilates blood vessels and produces a cooling effect. The additional blood flow to the skin2, however, makes pimples redder and can trigger rosacea attacks in people who have this form of acne. Eucalyptus oil is the ingredient in Hall’s Eucalyptus Cough Drops. It’s used in vaporizers when babies get colds. Extracted from the bark of eucalyptus trees, this oil can stimulate the skin to produce3 ceramides, the fat-like compounds that protect it from moisture. Of course, if you are trying to get rid of fat-like oils from your pores, you really don’t want to apply a product that stimulates your skin to produce other fat-like oils and seals them in. In rare cases, a strong odor of eucalyptus oil has been known to induce seizures4. Menthol cools the skin5. It also dissolves salicylic acid, the active ingredient in aspirin, and a compound that breaks up plugs of hardened skin oils in pores on oily skin. Used without salicylic acid (and the salicylic acid has to be in the right concentration and at the right pH to do any good), however, menthol just creates a tingle in the skin that turns into a itch in the skin, as it kills healthy cells around pores. Like the other Noxzema ingredients, menthol used in the wrong way only makes skin problems worse. Now let’s look at the bestselling Noxzema acne products one by one. This skin cleanser could be fairly rated “not all that bad” for very oily skin. It fights bacterial infection with the ingredient6 triclosan, and it contains a potassium hydroxide cleanser that can help break up plugs of sebum hardened in pores. The problem with this cleanser is that it contains so much potassium hydroxide that it can dry out and tighten all but the oiliest skin, creating about as many whiteheads as it removes. Of course, from a marketing standpoint, this is a great characteristic—it keeps customers coming back for more! This toner tightens the skin with the action of alcohol, menthol, and peppermint oil. It leaves the skin feeling fresh and cool. It fights acne-causing bacteria. So what’s not to love about Noxzema Anti-Blemish Astringent? The alcohol in this product can actually cause more blemishes! When you dry out your skin with alcohol, it protects itself by producing more oil. The box of Noxzema Anti-Blemish Pads looks like a real bargain. At a Dollar Store, you might get a box of 65 pads for as little as US $2.99. Even at regular retailers, the suggested retail price is just $4.49, or less than $0.07 a pad. The problem with these pads is the same as with the Anti-Blemish Astringent. The pads contain a mixture of alcohol, camphor, eucalyptus oil, and menthol. The alcohol both removes oil from the skin and stimulates the skin to create more, ensuring that you always need to use the pads. This blackhead cleanser may actually help remove blackheads on loose, oily skin. It contains tiny particles of polyethylene plastic that scrub the skin without injuring it, and it contains 2% salicylic acid7, which helps strip away the fats that hold dead skin cells to the surface and that plug pores. The problem with this and many similar cleansers is that you rinse away the helpful ingredients almost as soon as you put them on your face. As a cleanser, this product does not stay in contact with the skin long enough to break up blackheads. If you are an American over the age of 50, you probably can remember a time when the blue jar of Noxzema cleansing cream was the only product many stores carried for acne treatment. Now also available in a jar with a pump, this product was the mainstay of anti-acne skin care. The cream used to be made with lye, just to make sure it got all the dirt off your face. Phenol was added to make sure it stayed fresh—and you could be sure the bacteria off your fingers met sudden death when you dipped your fingers in Noxzema. Nowadays Noxzema cleaning cream no longer contains lye or phenol. You can’t use it to strip wax off your floors, or to prime outdoor surfaces for painting. However, the eucalyptus, menthol, and camphor that cause problems with almost all Noxzema products are still in the cleansing cream, and if you have sensitive skin, you really should avoid it. People who have especially resistant (non-sensitive) oily skin may be OK after using Noxzema, but there are better options. The appeal of Noxzema skin care products is that they smell good and they don’t cost very much. If you can spend just a few dollars more, however, you can treat your acne with a complete skin care system like Exposed Skin Care. You may spend a few more dollars upfront, but you won’t be perpetuating your acne care problems. You just might get rid of acne for good with Exposed Skin Care. With a money-back guarantee you have nothing to lose but your zits. Kotaka T, Kimura S, Kashiwayanagi M, Iwamoto J. Camphor induces cold and warm sensations with increases in skin and muscle blood flow in human. Biol Pharm Bull. 2014;37(12):1913-8. Ishikawa J, Shimotoyodome Y, Chen S, Ohkubo K, Takagi Y, Fujimura T, Kitahara T, Takema Y. Eucalyptus increases ceramide levels in keratinocytes and improves stratum corneum function. Int J Cosmet Sci. 2012 Feb;34(1):17-22. Mathew T, Kamath V, Kumar RS, et al. Eucalyptus oil inhalation-induced seizure: A novel, underrecognized, preventable cause of acute symptomatic seizure. Epilepsia Open. 2017;2(3):350–354. Published 2017 Jul 4. Park B, Kim SJ. Cooling the Skin: Understanding a Specific Cutaneous Thermosensation. J Lifestyle Med. 2013;3(2):91–97. Weatherly LM, Gosse JA. Triclosan exposure, transformation, and human health effects. J Toxicol Environ Health B Crit Rev. 2017;20(8):447–469. Rathi SK. Acne vulgaris treatment : the current scenario. Indian J Dermatol. 2011;56(1):7–13. I adore Noxzema. I have been using it for more than 50 years. Most people think that I am in my early 50's and I owe that to good genes and daily use of Noxzema. My daughter loves the fact that my face is so soft. Since I started using it before puberty, I think I escaped bad acne because I was using Noxzema daily. I don't know what I'd do without it. Same here!!! Agree with you totally (I also wrote my own comment as well).....I constantly am told people thought I was in my late thirties/early forties BUT I am in my mid fifties now!! You are right: good genes...good skincare...healthy eating...non-smoker...non-drinker...and active/fitness lifestyle. It ALL helps!!! OK. That tells us nothing, though. There is a reason sample sizes of one are useless. Especially since you probably never had the genese for acne. What would your skin look like had you used something without irritants? How much aging could you have avoided, or redness, or dryness? However young you look, you might look younger had you not damaged your skin. Or, the damage didn't affect you for whatever reason. That doesn't make the product safe. The article tells us why these ingredients damage skin, and you ignored everything it had to say because you didn't like it. Your experiences don't make science untrue. That's not how science works. Please read up on what a sample size is and why it is so important. Anecdotal evidence is meaningless. Boo boo boo, if you believe this article you are really scientifically inept. Noxzema works fine, if not amazing for most people unless you have some serious allergies. Why do you think Noxzema has been around for generations and is a growing competitive company? 1/27/14 I just purchased Noxzema Deep Cleansing Cream and it DOES contain Phenol...it is an ingredient listed on the label. I am wondering if I got an old container or if you are mistaken and it does still contain Phenol. Does any one know the danger of using this product? I would appreciate any info. Thank you. I am an actress who grew up in theatre having to use heavy make-up including pancake and I always had a tough the removing all that make-up at the end of a show. I also have very fair skin so I would break out a lot after many performances of heavy make-up until I was introduced to Noxema by a male dancer, yes he was gay, but no matter. He suggested to cover my face with it BEFORE I put the make-up on and use it to remove it afterwards. It worked beautifully and I rarely if ever broke out with acne or skin rashes again. I swear by it. Don't always be swayed by hate bloggers. People love to give their opinions and it usually is when they want to bash something. That is why I do not like to respond to these types of forums but clearly this writer has some pent up anger for some reason against Noxema. All I'm saying is it worked for me and I have very sensitive skin and don't mind the smell that much. It got the job done. What does him being gay have anything to do with suggesting Noxzema? I am also pro Noxzema and I have sensitive skin too. I can't believe what I'm reading!!!! I started using this when I was a child for sunburns, it gets the red out overnight and is cooling. I also use it on burns and cuts, and on my face when I break out bad. My 14 year old also uses it for acne and his face is always clear now!! no, neither of us have oily skin. I don't have sensitive skin either. As with most products. If it does dry you up, don't use it so frequently. I got my neighbor also addicted to it with her pale sensitive skin... she loves it. 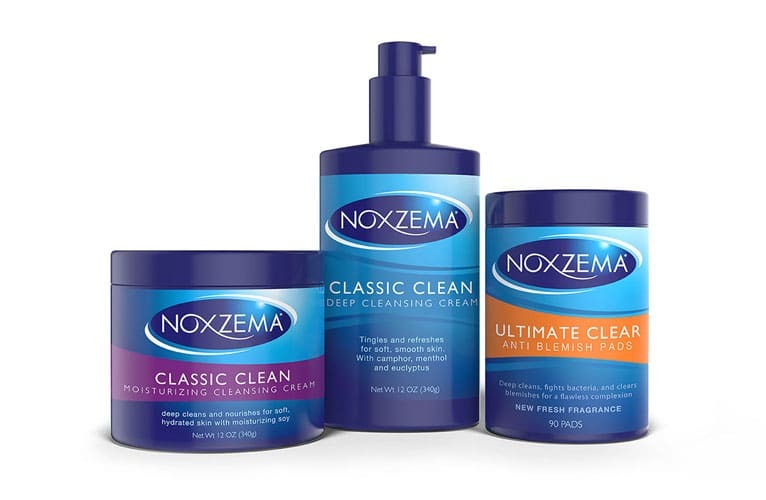 Hey everyone reading these reviews, I haven't used the new Noxzema products so I can not testify on their behalf, but I do use the original cleansing cream. I used to use it as a sixteen year old because my mom made me so I never broke out. I had clear skin as an adolescent, which is almost unheard of. I stopped using it and the acne problems occurred at 20. Then a couple months back, I recalled the name of the product my mom made me use, and I immediately used it again. Since then, my acne is gone and the few scars I had are eliminated so I know it's because of this product. me personally I think Noxzema works perfectly great, I mean seriously i've had bad acne in my teens, but then a friend introduced me to Noxzema and ever since then i feel so great about my skin. However , I personally wet my face and then apply it, slowly messaging my face in circles while applying, I leave it on long enough to dry out my pores (usually burns, but that's how I personally can tell it's working). After it dries I apply luke-warm water to my face and repeat the process every Morning and NIght. Noxema works extremely well for me!! I used it every night and the next day i could already see my acne clearing up. For fast results i recommend use twice a day. Once in the morning and once at night. It also helps if you dont touch your face after or during the day because all the oils on your skin clog up the pores while Noxema unclogs them. This is the only facial cleansing acne clearing cream that helps my acne and i 100% recommend for everyone to use! !